If you are one of those who doesn't know about the SID really, then you should have a deep look at this fantastic article explaining the assembler music routine of Rob Hubbard.. now you will know what really happens inside a SID chip. Have fun reading ! by Anthony McSweeney from C=hacking issue 5. How do you introduce someone like Rob Hubbard?? He came, he saw and he conquered the '64 world. In my estimation, this one man was resposible for selling more '64 software than any other single person. Hell! 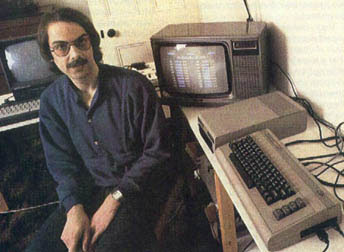 I think that Rob Hubbard was responsible for selling more COMMODORE 64's than any other person! I certainly bought my '64 after being blown away by the Monty on the Run music in December 1985. In the next few years, Rob would totally dominate the '64 music scene, releasing one hit after another. I will even say that some really terrible games sold well only on the strength of their brilliant Rob Hubbard music (eg. KnuckleBusters and W.A.R.). So how did Rob achieve this success? Firstly (of course) he is a superb composer and musician, able to make the tunes that bring joy to our hearts everytime we hear them! (also consider the amazing diversity of styles of music that Rob composed). Secondly, he was able to make music which was suited to the strengths and limitations of the SID chip. Just recall the soundfx used at the beginning of Thrust, or in the Delta in-game music. Perhaps the biggest limitation of SID must be the meagre 3 channels that can be used, but most Hubbard songs appear to have four, five or even more instruments going (just listen to the beginning of Phantoms of the Asteriods for example... that's only one channel used!!). I could really go on for (p)ages identifying the outstanding things that Rob Hubbard did, so I will finally mention that Rob's coding skills and his music routines were a major factor in his success. Check this one out, The Innovation SSI 2001 is an ISA card that had as a synth the rare MOS/CSG 6582 "SID"... Apparently it is today almost impossible to find one.. Good luck finding one !!! joysticks, which has the capability of supporting two joysticks with a "Y" connector (The joysticks, and Y connector are not included with the package). It also has a RCA jack for headphones or an amp, so that the sound can be played through your home stereo system. The board also has 3 banks of jumpers that enable or disable the joystick port, control the joystick sensitivity (nice feature), and the sound port address, if any I/O port conflicts occur. Innovation claims that installing a second sound board in the computer and connecting them to a stereo amplifier and headphones will give you pseudo stereo sound. I suggest you take the output of the board, and feed it into both the left and right channel inputs of your amp. This should have the same effect, and of course be much less expensive. Innovation currently has third party software support from Microprose and Spectrum Holobyte. Kris Backhaus, Sound Sales Director for Innovation says " I have been working closely with software companies and can guarantee at least four new games by fall". "I can also say tentatively at this time that at least five new companies are working with our board". Unfortunately, Kris could not disclose the names of these companies, at this time. Innovation seems focused at becoming the standard, and has stated that "We will do what it takes, to become the standard". Innovation seems very sincere in their wish to accomplish this goal. 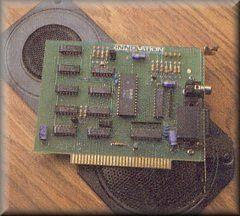 Innovation, by using a sound chip like the Commodore Sid chip have designed a very simple way to convert music, or sound effects for the Commodore computers to the MS-Dos, based machines. This will save time, and money for software developers who can then easily port these routines between machines. Continuing the first video from d0pefish featured in January 2007 here comes the second part. Now, armed with a BankStick to hold SID patches, the MIDIbox SID makes some noise of its own. a Spectrum plays SIDs ! 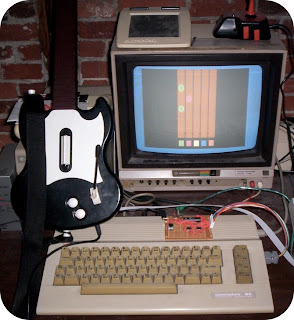 Now check this out, The Shredz64 project is an attempt to build an interface to connect the Playstation Guitar Hero controller (and any other PS controller) to the Commodore 64 computer, then create a Guitar Hero like game on the C64 utilizing the guitar controller. 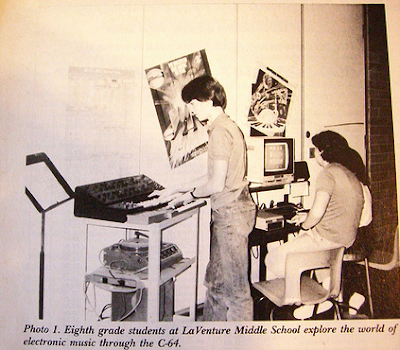 Some obstacles to be worked through include presentation of music given the 3 voice nature of the 6581 and 8580. Not only are all guitar functions mapped over successfully, but it works great for playing C64 games with a normal dual shock controller. What's more, since the same DB9 port is used, the PSX64 can be used on the Amiga, Atari and Sega Master System (All tested except SMS). The SOASC= project is an automated recording technique invented by Stein Eikesdal (Stone Oakvalley) in order to mass record music from the legendary Commodore 64 and its SID chips (6581 and 8580) into mp3 files. The goal is to record the entire HVSC SID collection played from REAL Commodore 64's (both old and new) as per collection #45 (April 17 2006.) 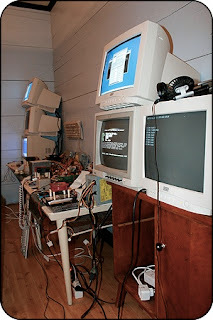 With PSID64 as the REAL C64 player and 64HHD as fileserver, it all connects to multiple PC's with own tailored software. If it crackles and pops....well..it's the true and authentic sound of a real Commodore 64! This is what we had in the past, and now the past will be the present for all Commodore 64 fans out there. This is a quick movie showing the outline of the actual recording taking place during the 4 month period of Commodore 64 authenthic recording project. Check out the website www.6581-8580.com for in-depth information and also the tunes (when completed) ready for download! The Prophet64 is expected today to be available again to order. New cartridges should have arrived !! This is a little video posted by Skrenos showing the Prophet 64 cartridge running on a Commodore 64c with dual SIDs. SID1 is a 8580 and SID2 is a 6581R2. The frame rate is lowered to 1 FPS as the audio is the most important part. This is just to show you what kind of sounds you can get out of the Commodore 64 with the P64 program.